A G.A.A., History, Rugby, Folklore, and Statistics of Omey Church Parish (Clifden) and External Additions, also An Insight Into Connemara Political Families. Featuring: Fr. Ned Stankard, Br. Vivian Cotter, Paddy Flynn, Matt O’Sullivan, Gerry King, Pat Walshe, Dr. Mick Molloy, Aidan O Halloran, Mairead Coyne, and Kenny Pollington. – See audio tracks commencing with Rugby o1 Fr.Ned Stankard. – See the first audio track on the Audio player. The history of political families in Ireland gives an insight into the evolving cultures that were part and parcel of the management of Ireland. It is well documented that the Irish Kings were at continuous war to attain/retain and defend their estates at regional/provincial and national level. This was followed by the invasion of Ireland by external bodies (that commenced with an invitation) and the acquisition of the Irish Kingdoms. However over time the management of Ireland once again returned to the native Irish with the formation of a new Irish Government which was officially acknowledged worldwide in 1921. It could be argued that Connemara followed a similar pattern; initially Irish families controlled/managed it. For example the Kealy/Keeley families were the dominant landlords during the 12th/13th centuries, until they were dispossessed by the ‘The ferocious O’ Flaherty’s’ in the latter part of the 13th century. The remnants of the O’Flaherty castles/forts are still visible in Connemara to this day; also some former residences have been restored and occupied. There are many stories that remain to this day in relation to the ‘The ferocious O’ Flaherty’s’. For example a reference to their conflict with the wealthy Normans of Galway City was established in text format and inscribed on thecity walls- “from the fury of the O’Flaherty’s, good Lord deliver us”. They were also in conflict with their fellow Irish families in Connemara. The folklore of how a section of the clan slaughtered the Conneely families and burned their commune near Doon Hill in Ballyconneely has descended through the centuries. This includes the hiding place of the pregnant Una Conneely who was the only one of her clan to escape on that fateful night- her hiding place retains its name to this day ‘Scáilp Una’ (Scáilp gaelic word for a gap in the rocks). The ‘The ferocious O’ Flaherty’s’, had also an alliance with Grainne Mhaol (Grace O’Malley) the Pirate Queen. Connemara was represented in the Irish House of Commons (Dublin) from the 13th century until the Act of Union (1801) under the constituency of Galway. From the Act of Union until 1885, MPs sat at the House of Commons (London), also representing the constituency of Galway. However this was delivered by primarily ‘Land Lord Gentry’ which included people like Richard Martin and Mitchell Henry and previously by John Eyre whose estate in Connemara is still not dormant. The Geoghegan Land Lords of Ballyconneely had also representation in the House of Commons but not representing an Irish constituency. It could be argued that it was 1885 that Connemara got its first really true representation, when Connemara was established as a constituency in its own right and electing one member to the House of Commons. The first member elected was Patrick James Foley (native of Leeds) in 1885 and represented the area until 1895. The second member elected was William O’Malley (Ballyconneely) in 1895 and represented the area until 1918. The third and final member was Padraic O’Maílle (Maam) who was elected in 1918 when he defeated William O’Malley; this status remained until the establishment of the new Irish State (agreed in 1921). Although the British Government bequeathed to the Connemarians their own constituency, alas the new Irish State did not follow suit and Connemara was once more incorporated into Galway County. This remains the norm to this day; however the current Minister for the environment (2014) has bestowed a municipal status on Connemara within Galway County Council elected members. 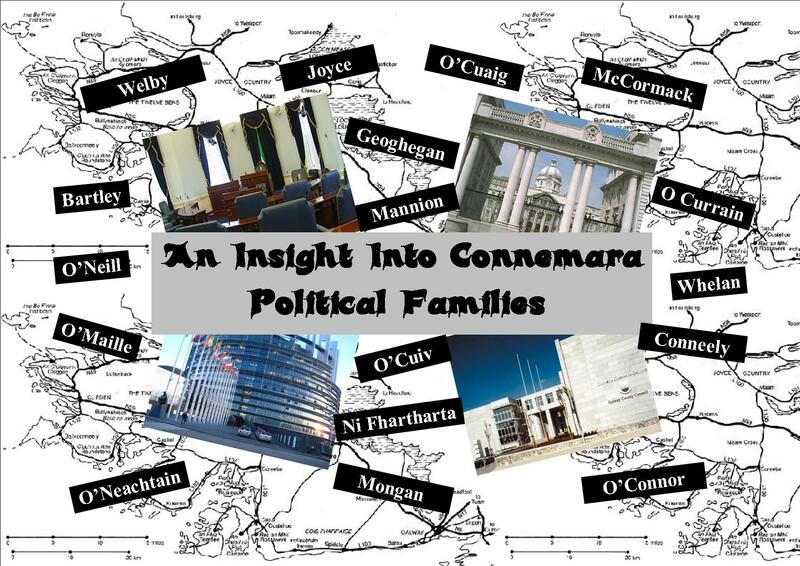 The new Irish State has delivered many Connemara political families that have made a contribution to the management of the State and the primary focus of this presentation is to give an insight into some of the families from and/or associated with Connemara. The families presented have a direct political association at various levels, for example Galway County Council, Dail Eireann/Seanad and also the EU Parliament. Some of whom are still active in political life. The presentation is a heritage research project compiled and edited in its entirety by Colleen Curran archivist/researcher /producer at Connemara Community Radio and John O’Malley an accredited researcher. The project is supported by the Leader Programme which is delivered by Forum Letterfrack. Footnote: There are many attempts in the public domain at giving a credible definition to the name Connemara but it could be argued that the really true meaning has evolved from its visual impact on a map. For example from the Spiddal region to Leenane incorporates a multitude of sea/bays/inlets which is a direct translation? ?